Issues about the site: typos, incorrect facts etc. Collaborations like link exchange, see info. If you want to add information about your local football club. For general questions about football you are welcome to contact the site as well, but notice that FootballHistory.org has history as its subject and not coming events. 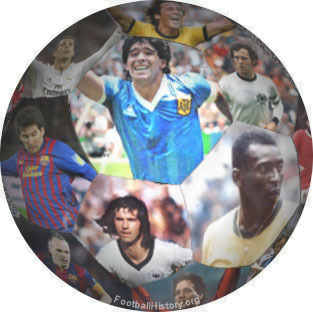 The ball collage picture includes pictures of Diego Maradona, Zico, Marco van Basten, Pelé, Thierry Henry, Messi, Beckenbauer, Andrés Iniesta, Gerd Müller, George Best, Ronaldo, Michel Platini.